Anton Zaslavski hatte ihn zuletzt gefeatured - jetzt spielen die Hormone verrückt - ein leicht emotionaler Song mit hübschem Backing. Troye hatte auch schon bessere Songs im Angebot; so kommt "Wild" lange nicht an "Happy Little Pill" heran, auch wenn die Produktion und der Gesang wie immer gut ausfallen. Trotzdem überzeugt mich dieser EP-Opener nicht so, wie ich es mir wünschen würde. Alles in allem gut hörbar. Decent track. 3.2. <br>EDIT: Chorus has grown on me, a 4 now. I ended up kind of liking Happy Little Pill and this is even better. ▒ Helemaal géén verkeerd plaatje uit eind augustus 2015 van de in Zuid Afrika geboren 20 jarige: "Troye Sivan Mellet", een Australische acteur, model, zanger en songschrijver ☺!!! The attention to detail here is something worth noting, because the more I listen to this the more I realise just how many subtle production effects are going on without me noticing, even after 100 listens! 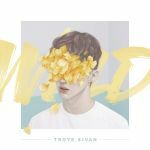 The child-like "Wilds" in the introduction still put me off slightly, but it doesn't matter because everything else works brilliantly; Troye's voice captures the right intensity and couples excellently with the very strong production. I also cannot write this review without saying how much of a golden moment 0:36 and 1:45 - it captures the perfect intensity and pushes the momentum into the chorus perfectly, while really highlighting Troye's voice and demonstrating the excellent production.<br><br>Timing seems to be the key to everything because I happened to stumble across this at a time when I had similar feelings for someone else, and so I related to this on an immense scale despite me never really wanting any sort of allegiance with Troye. 3 plus ... würde ich lieber von Selena Gomez hören. I didn't really expect Troye to make music like this just based off "Happy Little Pill", but there's no complaints here. It's a lovely little song. It's very well produced and sounds very aesthetically pleasing, with the background vocals and every other subtle detail working together to create a joyful listen. Still sounding good 18 months on from release. Une production lumineuse et apaisante que j'aime beaucoup. It's catchy and enjoyable. I liked it at the time and I've managed to avoid it enough to still find it really good when I hear it!